^ Thompson, Clive (2008-10-20). “Build It. Share It. Profit. Can Open Source Hardware Work?”. Wired 16 (11): 166–176. http://www.wired.com/techbiz/startups/magazine/16-11/ff_openmanufacturing 2009年4月30日閲覧。. 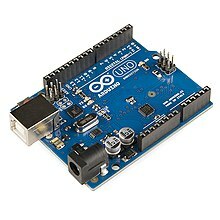 Sheepdog Software's Introduction to Arduino: "Getting Started" pages and sequenced programming tutorials, with help on hardware. Arduino tutorial – in portuguese, but with source codes and videos.